Farm safety demonstrations at Annaduff family day on August 12th in Annaduff GAA ground. Event commences at 2pm. Practical live demonstrations highlighting how simple farm accidents are happening using tractors, and connected machinery, presented by Peter Gohery, trained safety instructor, who himself suffered severe injuries in a farm accident. Guest speakers include: Thomas Crowe, Veterinary Surgeon, Brian Beirne, advanced paramedic and Sean Scollan. For the children a specially tailored presentation by Alma Jordan of Agrikids running through the afternoon. Subject to availabilty an air ambulance helicopter will participate in the event. Raffle tickets are only €5 for 3 tickets !!!! Get yours before their gone. So please support. Clothes collection: Thanks again to all who dropped off Clothes bags. We will continue until Saturday 11th of August. All types of clothes, shoes, old bags, belts, curtains, bed linen etc. Cant take duvets or pillows. Drop off to Annaduff GAA on Saturday Morning from 10am to 11am. Anyone that has bags to be collected we would be delighted to collect them for you. Your support is very much appreciated contact Niall Lyons 087 9852113 or Denny Dockery 087 9007217. Monies raised go towards underage training equipment for our younger people in the Parish. Newtown Engineering Under 17s Championship: Our U17s had a win over Mohill on Tuesday evening last to bring their Championship back on track, well done lads. Team: Caolan Quigley, Tommie Taylor, Ultan Kelly, Declan Gill, Francis Shanley(0-1), Cormac Kane, Michael Murray(1-4), Craig McGuinness(0-1), Jason ward, Daniel Bosquette, Jack Hughes(0-6), Jack Kelly, & Liam Taylor(1-2)(2f), . Subs used: Hugh Boyce for Liam (27min) & Niall Quigley(1-0) for Jack Kelly (HT). Annaduff had a great start to the second half scoring an early goal and point but in fairness to Mohill they scored another goal and point of their own. They continued to swap points before Peter Moran drove a low hard shot into the Mohill net to put Annaduff two points up. In the final minutes of the match both teams scored two points to leave the final score Annaduff 3.11 Mohill 3.09. These were two evenly matched teams who provided the supporters with a fine display of football. Annaduff team – Patrick Beirne, Declan Cox, Eoghan Ridge, Kevin Faughlan, Ross O’Shea, Kyle Russell, Luke Fitzsimons, Darren Cox, Senan Mooney, Oran Beirne, Peter Moran, Jack Higgins, Eamon Healy, Nathan Cox, Oisin Hannon, Jake Charles and Sam Heslin. Our Intermediate Championship got off to a good start in Cloone on Sunday last where the Annaduff lads easily overcame Mohill in the first round. Finishing out on a full time score Annaduff 1-22 Mohill 0-07. Team: Darragh Burke, Hugh Moylan, Keith Duignan, Chris Farrell, James Cox, Dillon Keane, Dean Gill, David Duignan, Ronan McCormack(0-1), Eoin Gill(0-5), Kenny Cox(0-5), Gavin O Brien(1-3), Conor Reynolds, Colm Cox(0-6), Alan Glancy(0-2). Subs: Stephen Murray for Hugh(32min). Pyramid Bookmakers JAC: Our Juniors got the perfect start to the Championship on Sunday against opponents Mohill to finish off a great weekend on a full time score Annaduff 2-18 to Mohill 0-08. Team: Jim McCormack, James Riordan, Nigel Cox, Donal McNabola, Mathew Reynolds(0-1), Adam O Hagan(0-2), Michael Cox(0-4), Johnny O Connor(0-1), Noel Ward, Marcus Guckian(0-1), Ray Cox(0-1), Sean Quigley(0-6)(2f), Jason Lyons, Shane Cox(2-0), Joe Cox(0-2)(1f). Sub: Michael Rowley for Donal mcNabola. 29th of July, Numbers 1, 9, 11, 20. No winner. Division 2 Championship U17s home to Melvin Gaels at 7:30pm on Monday (30th) . Division 1 Championship U13s away to Leitrim Gaels at 7:30pm on Tuesday (31st). Intermediate Football Championship (round 2) Carrigallen in Ballinamore at 5:30pm on Sunday (5th). Raffle tickets are only €5 for 3 !!!! Which are now on sale now. So please support. We will also be looking for volunteers for the big day, keep it in mind folks. Dunnes Bar Division 2 League: Congratulations our D2 team on promotion to Division 1 for 2019. Following what can only be described as a tough, close encounter with Dromahair on Saturday last in Annaduff. In what was winner takes all, in the last round of the league. Very defensive football from both sides with a half time score of only 0-5 a piece and this continued to the bitter end, finishing with a 10 point each draw. Which was enough to push Annaduff over the line to finish top of D2 and guarantee promotion for next session. Super result a lot of very proud Annaduff people left the field on Saturday. Well done to the full squad & management of Karl Foley, Michael Rowley, Padraig Dunne and Terry McGuinness. Team: Darragh Burke, Mattie Cox, Keith Duignan, Mark Beirne, Dean Gill, Dillon Keane (0-1), Jimmy Cox, Ronan McCormack (0-1), David Duignan, Conor Reynolds, Eoin Gill (0-1), Kenny Cox (0-1)(f) , Sean McNabola (0-1), Sean Duignan (0-2)(1f), and Alan Glancy (0-1) Subs: Hugh Moylan for Mattie (18 min)injured, Gavin O Brien (0-1) for Ronan (38min) Ray Cox (0-1)(f) for Sean D (42min) Colm Cox for Sean Mc (51 min) Injured, Chris Farrell for Keith (55min) and Adam O Hagan for Jimmy (58min). Barna Recycling Under 13s Championship: Our U13s travelled to Glencar-Manor on Thursday last in the second round of the D1 Championship. A very tough, physical game with our side coming away with the 2 points with a full time score Glencar-Manor 2-04 Annaduff 2-05, well done boys !!!. Under 11 Boys: Well done to our U11’s who travelled to Drumkeeran on Saturday morning last. Coming off the back of a tough U13 game on Thursday night, all players did really well and as usual, tried really hard. We had three competitive games on the day Drumkeeran, Melvin Gaels & St Josephs(Aughavas/Carrigallen), with all players getting a chance to play in different positions. Some excellent passing movements displayed, brilliant defending and some great scores. Intermediate / Junior A Championship: The dates are out for each round of the upcoming Championship. Round 1: Mohill Sunday the 29th July, Round 2: Kiltrubid Sunday the 12th August, Round 3: St.Marys Saturday the 18th August. Round 1: Mohill Sunday the 29th July, Round 2: Carrigallen Sunday the 5th of August, Round 3:Eslin Saturday the 11th of August, Round 4: Kiltrubid Friday the 24th August and Round 5: Ballinamore on Sunday the 9th of September. Lotto: The Annaduff Parish & GAA lotto, Next draw takes place in Duignans Drumsna on Sunday next the 29th of July, Jackpot now stands at €4800. Division 2 Championship U17s away to Mohill at 7:30pm on Tuesday (24th) . Division 1 Championship U13s home to Mohill at 7:30pm on Thursday (26th). Anticipation is growing ahead of this event, when The Restaurant comes to Coxs Steakhouse, Dromod on Saturday night the 16th June. We look forward to welcoming a Celebrity Chef, a panel of Judges, and the very best in food, wine and music, as well as fantastic spot prizes, for each table on the night. Quite a few tickets have already been reserved, so the advice is to book early with any Club official. New Business Venture: Annaduff GAA, the residents of Dromod and Annaduff parish, would like to wish Angela Neary the very best of luck in her new venture. Angela who lives in the village of Dromod and who helps out with the underage boys whilst also taking part in the mothers & others in the club. Angela has set up her Chartered Accountant business in Dromod, Opening hours: Mon-Fri 9.00am to 4.30pm. Contact details: 0719658410, 087 9846015. Calling all Ladies from Dromod to Drumsna and beyond, Gaelic for Mothers and Others has now resumed on Wednesdays at 8pm in Pairc Ui Choilig Annaduff. This is open to all, no previous skills necessary, all makes, shapes and ages are welcome. Why not come along on Wednesday next, and if you like what you see, join us. Registration takes place for current and new members on Wednesday May 23rd, from 7.30 to 8 pm, and on Saturday May 26th, from 10am – 11am. The Dunnes Bar D2 League: Drumreilly were the visitors to Annaduff on Saturday evening last. As the Annaduff lads continue their un-beaten form in 2018. It was Kenny Cox who got the score board going inside the first min of play. Drumreilly converted a point from a 45 and another from play. The sides remained fairly even throughout the first half with points from Kenny, Ronan McCormack, Alan Glancy and Conor Reynolds to leave half time score Annaduff 0-7 to Drumreilly 0-7. Ray Cox came in for the start of the second half with a point converted from Annaduff winning the ball from the throw in. Three minute’s in Drumreilly got a goal to put them 2 points ahead but this lead was soon put to bed with a point from Seamus Mulvhill a point from a free by Sean Duignan and a point from play for Kenny. Whilst Annaduff were the better team in the second half, they were unfortunate with some missed goal opportunity’s. In the 56th min Sean Mc got a point from play after coming in for Seamus. The 59 min Colm Cox who had only just been subbed for Alan buried a goal from one on one with the Drumreilly keeper that was the end of Drumreillys hope of any result. Kenny and Dillon finished the Annaduff business side with a point a piece. Drumreilly did finish with a point from a free which brought an end to another super result for Karl Foleys men Full time score: Annaduff 1-14 to Drumreilly 1-09. The Swan Bar D3 League: Our Juniors were home to Aughawillan on Sunday last. The Annaduff juniors made easy work of Aughawillans junior team who were struggling with numbers finishing out full time: Annaduff 3-19 to Aughawillan 1-05. Clothes collection: That time of year again folks the club is doing a clothing collection starting on Saturday next the 26th May. Now is your chance for some spring/summer cleaning. All types of clothes, shoes, old bags, belts, curtains, bed linen etc. Cant take duvets or pillows. Your support is very much appreciated contact Niall Lyons 087 9852113 or Denny Dockery 087 9007217 we will take them at annaduff Gaa Club house on Saturday morning from 10-11am or phone for collection. Speedy Recovery: Annaduff GAA would like to wish a speedy recovery to one of the best underage defenders in Leitrim. Eoghan Ridge following an injury at a School game recently. Hopefully it wont be too long until Eoghan is back out on the field. Club Annaduff : Membership is now due for 2018, please contact Ciaran Dolan, John Thornton or any of club executive’s to join or renew for this year. Your Club Annaduff membership is upmost important part of our fund raising goes to up keep and maintenance of our Gaa grounds and facilities. Thank you for your continued support !!!. Lotto: The Annaduff Parish & GAA lotto draw took place in Coxs Steak house Dromod on Sunday last the 20th of May. Numbers were 3,6,14.17. No winner the Jackpot now stands at €4400 !!.. Best wishes to Leitrim Seniors as they face our Roscommon neighbours in Páirc Seán Mac Diarmada on Saturday next (26th) at 5:30pm. The Swan Bar D2 League: Mohill were the visitors to Annaduff on Sunday last. Karl Foleys men remain with a 100% record in the league so far this year. Kenny got the business end up and running with a point inside the first 3 min. followed by a point from Mohill. Sean Mc with a point in the 8th min. A pull down of Colm Cox in side the square left Sean Duignan converting a goal from the Penalty spot. Mohill scored a point before Eoin Gill stuck another great goal with some great passing off his team mates. Sean Mc and Kenny scored the next 2 points from play before another well converted point from a 45 for Mohill. Mohill had a point from play and 1 from a free before Sean Mc slotted another in the 30 min just before the break Sean Duignan converted a point from a free to leave Annaduff with a lead of 2-6 to Mohill 0-5 at Half time. The second half started with 2 points from the visitors before Sean Mc converted a point from a free followed by 1 from play. Mohill converted 2 from frees and 2 from play before a well turned over ball from Stephen Murray found its way to Kenny to slot it over followed on with another in the 57min . Eoin Gill finished the score board with a point in the 59min to leave another super perforamance from the Annaduff lads Full time : 2-11 to Mohill 0-10. Team: Darragh Burke, Stephen Murray, Keith Duignan, Hugh Moylan, Mattie Cox, Dillon Keane, Dean Gill, David Duignan, Ronan McCormack, Eoin Gill(1-1), Sean McNabola(0-5)(1f), Kenny Cox(0-4), Ray Cox, Colm Cox, and Sean Duignan(1-1). Subs: Mark Beirne for Ronan (34min), Conor Reynolds for Colm (40min), Sean Quigley for Sean D (42min), Michael Cox for Ray (55min), and Donal McNabola for Sean Mc (58min). 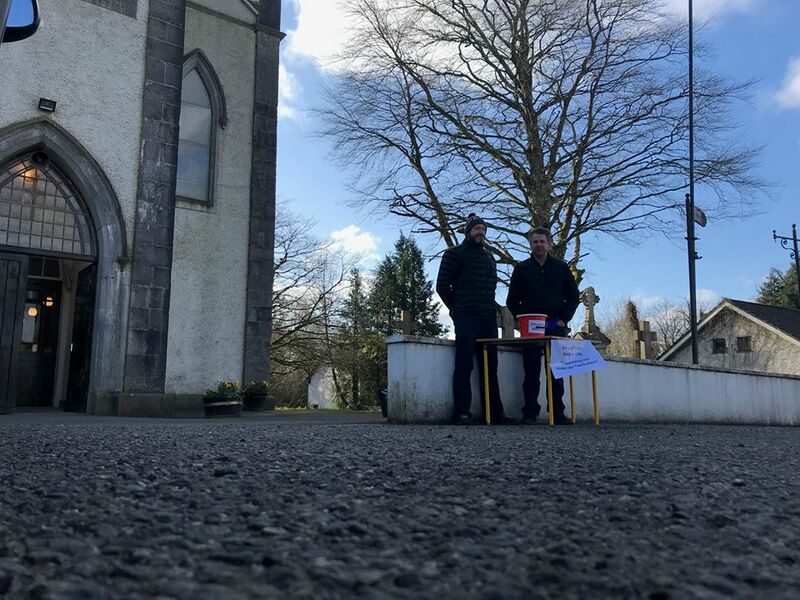 Church Gate Collection: Big thank you to everyone in the Parish that contributed to and collected for Leitrim GAA Church gate collection over the weekend. Calling all Ladies from Dromod to Drumsna and beyond, Gaelic for Mothers and Others has now resumed on Wednesdays at 8pm in Pairc Ui Choilig Annaduff. This is open to all, no previous skills necessary, and all makes, shapes and ages are welcome. Why not come along on Wednesday next, and if you like what you see, join us. Registration takes place for current and new members on Wednesday May 23rd, from 7.30 to 8 pm, and on Saturday May 26th, from 10am – 11am. First Holy Communion: Congratulations to the Boys & Girls from Annaduff School who made their first holy communion on Saturday last in Annaduff Church. They definitely got the sunshine on the day ! Anticipation is growing ahead of this event, when The Restaurant comes to Coxs Steakhouse, Dromod. We look forward to welcoming a Celebrity Chef, a panel of Judges, and the very best in food, wine and music, as well as fantastic spot prizes, for each table on the night. Quite a few tickets have already been reserved, so the advice is to book early with any Club official. Well done to our Boys and Girls National Schools Teams who are presently participating in the various Inter Schools Leagues. Both sides are competing very well, and our thanks are extended to Master Tighe and his Staff, for their continued work with the children. Westlink Coaches U15s League; Well done to our U15s who over came Kiltubrid on Thursday last on a full time score Annaduff 7-11 to Kiltubrid 3-6. Next round sees us away to Melvin Gaels on Thursday (17th). Remember to keep up to date to whats happing in the parish log onto Annaduffgaa.ie / Facebook Annaduff GFC or on Twitter @annaduffgaa. Lotto: The Annaduff Parish & GAA lotto draw takes place in Coxs Dromod on Sunday next the 20th of May. Get your tickets in and as always thanks for your continued support !!!!. Fixtures: U15 play Melvin Gaels on Thursday (17th) in Kinlough at 7:30pm. D2 Home to Drumreilly on Saturday (19th) at 7pm. D3 Home to Aughawillan Sunday (20th) at 12 noon. Club Annaduff : Draw took place in Coxs on Friday night last. €250 winner Padraig Dunne €150 winner Ciaran McNamara. Membership is now due for 2018, please contact Kevin Ludlow, Ciaran Dolan, John Thornton or any of club executive’s to join or renew for this year. Your Club Annaduff membership goes to up keep and maintenance of our Gaa grounds and facilities. Thank you for your continued support !!!. Sports and Health Forum; Huge reaction to the sports and health forum which we hosted in Cox’s Restaurant on Friday night last. Each of the 5 speakers delivered compelling and very relevant presentations. Our thanks are extended to Michael Moyles, Chrissie Mc Keague , Fabienne Cooney, Ryan Jones, and Dr Niall Moyna,. Compliments to the staff and management in Cox’s, our MC on the night Donal Fox, and our senior technical director Barry Guckian and everyone who attended and assisted. 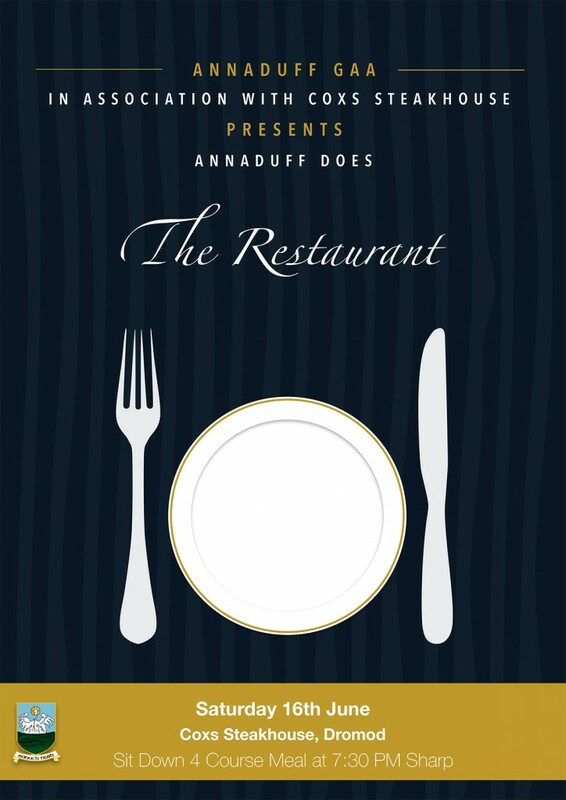 Annaduff does The Restaurant: Following on from the superb productions of Annaduff Does Strictly and Annaduff does Lip Sync we are delighted to announce that Annaduff will be doing The Restaurant in the award winning Cox’s Steakhouse, Dromod on Saturday night the 16th of June 2018. This will be a night of excellent food, top class music and fun. Watch this space for more details,,,,,,,. Westlink Coaches U15s League: A disappointing game for our U15s against a strong Dromahair side on Thursday last in St Osnats. A couple of lads injured before and during the game didn’t help but none the less a great bunch of lads that will bounce back. We follow on the league with Fenagh the next round in Annaduff Tuesday at 7:30pm (1st may). The Swan Bar Division 3 League: Our Juniors travelled to Drumkeeran on Saturday evening last. Under what can only be described as poor conditions with a very wet pitch. The Annaduff lads came away with the 2 points which leaves Annaduff juniors in a good position in the D3 league so far. Team: Shane Cox, Chris Farrell, Keith Duignan, Donal McNabola, Dean Gill(0-1), Mathew Reynolds, Stephen Murray, Mark Beirne, Eoin gill, Jason Lyons(0-1), Sean Duignan(0-2)(1f), Gavin O Brien(1-2), Michael Cox(1-1), Colm Cox(0-2), and Sean Quigley(1)(f). Subs: Adam O Hagan(0-2) for Jason (34min injured) Owen Reynolds for Mark (62 min injured). The Underage girls: Are due to start next weekend (May bank holiday) As the number of Girls in the club are growing this in turn means more help is needed. We are asking that more parents would try and get involved to help out with the girls, If you can spare an hour on a Saturday morning or for any further info contact Ann Marie Cox. You can check for up coming events on Annaduffgaa.ie or Facebook Annaduff GFC. Lotto; The Annaduff GAA and Parish lotto draw will takes place in Duignans Drumsna on Sunday next 6th May , Jackpot now stands at €4200 !!! So please get your tickets in and as always thank you for your continued support !!!. Leitrim Seniors: Best wishes to Brendan Guckian and the Leitrim Senior team as they face New York in Gaelic Park on Sunday next in the Connacht Championship. Reminder: On Friday next the 27th of April 2018, Annaduff GAA Club are hosting a Sports and Health forum in Coxs Restaurant, Dromod. This event will be of relevance to both Adults and Children. Michael Moyles, P E Teacher, ex-Annaduff Manager, and current Leitrim Trainer. Chrissy Mc Keague, Teacher, current Slaughneill and Derry Hurler and Footballer. Fabienne Cooney, P E Teacher, Coach, and current Galway Ladies Footballer. Ryan Jones, Pharmicist, current Derrygonnolly and Fermanagh Footballer. Dr. Niall Moyna, head of Dept. of Health and Performance at DCU, and of Operation Transformation fame. This night will cover topics, such as correct diet and nutrition, child obesity, benefits of exercise and sports, general well being, various age appropriate training programmes, and managed player development, as well as much more. Guests will also speak of their own home Clubs, how they are structured and have developed, and how playing sport has influenced their respective lives and careers. The event starts at 7.45pm sharp, and is open to all Parishioners. It is free of charge, and light refreshments will be available at the half way break. We encourage people attending to come early, as seating will be limited. U15; Our U15 start their league on Thursday next (26th) away to Dromahair. Followed up on Tuesday (1st May) Home to Fenagh. Best wishes to the management and team. Under academy: Following on from the U13s winning their league Annaduff GAA are looking for the next generation of stars, Our Underage academy is now up and running on Saturday mornings at 10am any Parents with boys from 5 to 11 years call out any Saturday Morning. The underage girls are due to start the May bank holiday weekend we are looking for more parents to help out with the girls, If you can spare an hour on a Saturday morning or for any further info contact Ann-Marie Cox. You can check for up coming events on Annaduffgaa.ie or Facebook Annaduff GFC. Swan Bar ACL Division 3: Our junior team travelled to Drumshambo on Saturday evening last to face Allen Gaels. The Annaduff lads got out of the traps first with 2 frees from Sean D and 2 points from play from Adam before the Gaels converted a point from a free in the 10th min followed with 1 from play. 14 min into the first half a well converted free from Sean D. The gaels and Sean D exchanged points, Before the break Gavin shot 2 points and 1 from Sean Q left our Juniors with a lead at half time Annaduff 0-09 to allen Gaels 0-04. The second half was played with some high intensity throughout with the Gales determined to close the score gap in the 43rd min the Gales were within a point of catching the Annaduff side but a point from a free from Sean D followed by 1 from play by Gavin and 2 from Sean Q left 5 between the sides but in the 58th min the Gaels converted a goal from a penalty followed with 2 points from play left a draw at full time Annaduff 0-13 to Allen Gaels 1-10. Team; Shane Cox, Keith Duignan, Stephen Murray, Chris Farrell, James Cox, Dean Gill, Mathew Reynolds, Mark Beirne, Owen Reynolds, Gavin O Brien(0-3), Sean Duignan (0-5)(4f), Adam O Hagan(0-2), Sean Quigley(0-3), Colm Cox, and Michael Cox. Subs; Donal McNabola for James (35min) Eoin Gill for Owen (38min) Jason Lyons for Colm (51min) Colm Fitzpatrick for Mathew (52min) James Riordan for Adam(56min). Lotto; The Annaduff Parish & GAA lotto draw took place in the Brandywell Dromod on Sunday the 22nd. Numbers 14,16,19,23. No winner the Jackpot now stands at €4200 !!.. Next draw takes place in Duignans Drumsna Sunday 6th May , Get your tickets in and as always thanks for your continued support !!!!. Fixtures: The swan Bar Division 3 league are away to Drumkeeran on Saturday 28th at 7pm. Date for your diary; Friday 27th of April our club will be holding an open information night in Coxs Restaurant Dromod. Michael Moyles current Leitrim Senior Trainer and former Annaduff Senior coach will be one of the speakers on the night. The evening will be rounded off with a presentation from Dr Niall Moyna of Operation Transformation fame, who is in internationally recognised figure in the area of sports science, exercise and nutrition. The event will be free of charge and promises to be an interesting night for everyone. Newtowngore Engineering U17s: The U17s semi final V Melvin Gaels game due to be played Saturday was postponed until Thursday(12th) in Annaduff at 6:30pm. Dunnes Bar ACL Division 2: Were away to Bornacoola on Saturday last. The Annaduff men were on top form starting off with a point from play from Sean Mc and Eoin G inside first 2 minutes of play. A free from Kenny before the bors got on the score board with a point from a free. In the 10th min a super pass from Seamus to Sean D which was buried into the Bor net. Three more points from Eoin, Sean Mc and Kenny before the Bors got another point from a free followed by One from play and one from a free before the break left Karl Foleys team going in at half time 1-06 to Bor 0-04. Bornacoola did come out in the second half more tuned in first point from a free followed by a Bor goal in the 35th min closed the gap to 2 points, Sean Mc followed with one from play and one from a free. The Bors did answer with 2 points before Ronan in the 21st min pointed also followed by Dillon. Another converted free from the Bors and one from play couldn’t close the gap. In the 60 min Ray finished off the score board with a point to leave the Annaduff men two wins from two in the league so far. Swan Bar ACL Division 3: Our junior team were host to Aughavas on Sunday last. The visitors were by far the stronger team throughout, half time lead 2-07 to 0-05.The second half did start well for the Annaduff lads with a goal from Michael followed by a point from Colm but didn’t take long for Aughavas to power on again with 2 goals in the 42nd and 43min the writing was on the wall finishing deserving winners on a scoreline of Aughavas 4-16 to Annaduff 1-08. Team: Shane Cox, Daire Guckian, Noel Ward, Stephen Murray, Colm Fitzpatrick, Dean Gill (0-1), Mathew Reynolds, Owen Reynolds (0-1), Gavin O Brien (0-1), Jason Lyons, Michael Cox (1-0), Johnny O Connor, Colm Cox (0-2), Donal McNabola,and Sean Quigley (0-3)(F). Subs: Keith Duignan for Daire (24min) Chris Farrell for Colm Fitz (24min) James Cox for Jason (24min) Nigel Cox for Donal (36min) Jason for Johnny (45min) Thomas Flannagan for Mathew (45min). Wedding bells: Congratulation’s To former Annaduff Ladies player Maeve Reynolds who Married Liam Reynolds who hails from Cloone over the weekend reception was held in Lough Rynn Castle. We wish them best wishes for their future together. U7s-U11s: There was a super turnout of boys to the first day back at training for our younger players on Saturday last. Anyone who has not already registered can do so on Saturday next or come along and see for yourself the great work and fun with the kids from Dromod, Annaduff and Drumsna. Fixtures: U13s home to Drumkeeran Monday the 9th at 6:30pm. New School Bus : After a lot of work from some of the locals great to here at long last the children from Dromod village and surrounding area are getting bus transport to Annaduff school being part funded by parents and local link, Super news for our parish. Next draw takes place in The Brandywell on the 22nd April, Get your tickets in and as always thanks for your continued support !!!!. Date for your diary; On Friday 27th of April, the Club breaks new ground. When our club will hold an open information night in Coxs Restaurant Dromod, which will feature speakers from top current inter county players to leading authorities in the area of sports science. The players will draw on their own experience to speak on managed youth development, achieving proper GAA Club structures and player welfare. The evening will be rounded off with a presentation from Dr Niall Moyna of Operation Transformation fame, who is in internationally recognised figure in the area of sports science, exercise and nutrition. The event will be free of charge and promises to be an interesting night for everyone. Definitely one for your diary. More details next week. U17s League were home to Melvin Gaels on Saturday last. Melvin Gaels were missing a couple of lads from injuries but none the less our lads got off to a super start from the through in with 4/5 passes Daniel managed a super goal, didn’t last long as Melvin Gaels followed up the field from our kick out to even with a goal of their own. The Annaduff lads suffered another blow when mid fielder Hugh when off injured 4 min in. But his replacement Ultan went in flying to pop one over the bar a min later. The Annaduff lads were very strong throughout the first half with a hat trick of goals from Daniel, a goal and a point each from Jason and Michael and 5 points from Liam, a point from Francis and Jack, Melvin Gaels did come back with 2 goals and a point before the break to leave the sides Annaduff 5-10 to Melvin Gaels 3-01. The Annaduff lads took ownership with the commencement of the second half with some brilliant defending and a goal from Francis 2 points from Jason, Michael and 1 from Jack also subs Craig and Keelan. With only 1 point scored in the second half by the visitors to leave Annaduff with a super finish of 6-16 to Melvin Gaels 3-02. Team: Padraig Kane, Joe O Carroll, Tommie Taylor, Cormac Kane, Declan Gill, Francis Shanley(1-1), Jack Hughes(0-2), Hugh Boyce, Jason Ward(1-3), Michael Murray(1-3), Liam Taylor(0-4)(1f), Daniel Bosquette(3-1). Subs;Ultan Kelly for Hugh(4min) Craig McGuinness(0-1) for Tommie (40min) Shane Faughnan for Jason (45min) Keelan Lynch(0-1) for Daniel (45). U7s-U11s; The younger boys football is due to start on Saturday the 7th of April. Any lads not already registered can do so on the first day back. Lots of fun and skills and new children always welcome come along on the day and see for yourself. Under13’s; Were away to Kiltubrid at 1.30pm on Sunday last. It was an even enough match in the first half with both teams kicking some wides and Liam McNamee made a number of good saves but then we started to take points from play through Senan, Darren and Eoghan. Annaduff got a goal late in the first half through Nathan Cox to go in 1.05 – 0.04 at half time. In the Second half Liam made some more good saves as Kiltubrid went for goals, Kyle, Eoghan and Patrick carried the ball from defence into attack and won a number of frees. Senan and Darren took frees and Darren added a number of points from play with Nathan getting another goal. Final score Annaduff 2-11 Kiltubrid 1-06. Team; Liam McNamee, Kyle Russell, Patrick Beirne, Oran Beirne, Eoghan Ridge(0-1), josh Gill, Darren Cox (0-7), Mel Fitzpatrick, Declan Cox, Caolan Newton, Senan Mooney (0-3), Nathan Cox (2-0) and Oisin Molloy. Gum Sheilds; A reminder from the county board ALL Players must wear Gum shields for training and football games because remember if teeth are damaged or broken with no gum shield you are NOT covered by players insurance, its in every ones interest to have a gum shield. Division 3; Were host to Carrigallen on Saturady last. The visitors got the first score inside the two min mark, it took a few minutes for our lads to settle into the game after nine minutes before Sean D slotted over a point from a free followed by a point each from Johnny and Eoin G. Carrigallen and Sean Q exchanged a point a piece, Carrigallen followed up with another point before Keith following a second yellow was sent to the line. With 20 min gone Carrigallen did make use of the extra man for the last 10 min of the half outscoring our lads by 4 points to 1 free taking by Sean D leaving the half time score Annaduff 0-6 Carrigallen 0-9. The break did suit the Annaduff lads because the second half started with a point from Michael followed by a point from a free from Sean D, followed 2 min later with a point from frank. In the 38th min a free pointed by Frank brought our lads right back into the game. Carrigallen did come back with some fire power to put 3 points between the posts with a couple of scoring opportunities missed by the home side left Carrigallen with a 1 point advantage which they carried until the final whistle. Full time score Annaduff 0-12 Carrigallen 0-13. Team; Daragh Burke, Donal McNabola, Chris Farrell, James Cox, Stephen Murray, Dean Gill, Owen Reynolds, Keith Duignan, Eoin Gill(0-2), Jason Lyons, Frank McNabola(0-2), Sean Quigley(0-2), Michael Cox(0-1), Sean Duignan(0-4)(f), Johnny O Connor(0-1). Subs; Daire Guckian for Johnny (HT) Eoghan Moylan for Stephen (36min) Ronan Egan for Owen Reynolds(43min) Colm Cox for Jason(44min). Baby Boom in Dromod; Congratulations to one of our club players Colm Cox And wife Edel on the birth of their Son Finbarr another future forward for Annaduff no doubt. Lotto; The Annaduff GAA and Parish lotto draw took place in Coxs Steakhouse Dromod on Sunday the 25th March, No winner this week. Next draw takes place in Mc Loughlins, Drumsna the 8th of April. Jackpot now stands at €4000 !!! So please get your tickets in and as always thank you for your continued support. Fixtures; D2 away to Glencar-Manor 12 noon Sunday 1st April. D3 away to Glencar-Manor 1:45 Sunday 1st April. U13s away to Drumkeeran Monday the 2nd at 6:30pm. Sympathy’s; Annaduff GAA would like to extend our sympathy’s to the family & friends of the late Theresa (Tess) Gannon Drumsna. Also to Joe O’Carroll on the passing of his Grandmother Margaret Morgan Dublin, may their souls rest in peace. Bord na óg; Many thanks to the Coaches who carried out the Church gate collection over the weekend and to all of you who donated. The monies go towards the development and training equipment for our underage footballers. Your continued support is very much appreciated. !!! U17s were home to Glencar-Manor on St.Patricks morning. A blustery Annaduff Saturday morning which saw a fairly low scoring game but still was an entertaining one. Annaduff leading the first half by 4 points to 1. The second half started with Manor having the wind and getting the first point of the second half but a well taken goal by Liam kept the Annaduff lads ahead. Manor got the next 3 scores with 2 points and a goal, to follow was a point by Liam. Another goal got pass Padraig by the visotors but a super goal by Daniel to leave Annaduff only 1 point ahead which the lads worked hard to keep. Full time score Annaduff 2-05 Glencar-Manorhamilton 2-04. Well done to all involved. We Play Melvin Gaels on Saturday next 24th March in Annaduff at 12 noon. U13s; The Annaduff v Gortlettragh match throw in at 12 in Annaduff on bank holiday Monday. The two teams scored a goal each in first few minutes then Gortlettragh scored two quick goals to go into the lead. Annaduff had a few wides before getting a point and then three goals without reply to go in at half time ahead by a goal. Annaduff were more accurate in the second half with their point shooting scoring 9points and a late goal. It was a good sporting match with relatively few frees and a good display of football. Team; Senan Mooney, Eoghan Ridge(0-2), Kyle Russell, Patrick Beirne, josh Gill, Oran Beirne, Darren Cox(3-5), Mel Fitzpatrick, Declan Cox, Nathan Cox(1-2), Oisin Hannon(0-1), Liam McNamee(1-0) and Eamon Healy’s.Full time score Annaduff 5-10 Gortletteragh 4-02. School football; The Annaduff School boys are again in the D1 competition due to start on the 16th of April. Annaduff have a bye in the first round. The 23rd of April Annaduff boys are away to Drumshambo NS. The 30th of April home to the Gaelscoil. The 14th of May home to Leitrim NS. The 17th of May the final round away to Mohill NS . Best of luck boys !! Division 3 League ; Our junior team are home to Carrigallen on Saturday next the 24th at 5pm. Lotto; The Annaduff GAA and Parish lotto draw will take place in Coxs Steakhouse Dromod this coming Sunday the 25th. Jackpot now stands at €3900 !!! So please get your tickets in and as always thank you for your continued support. New Referees; As the years football begins Leitrim GAA are trying to recruit new referees, Annaduff GAA would be delighted to here from any members interested in putting their name forward. Training begins on the 9th of March in the Bush Hotel at 8pm. Contact Sean 086 1267414 for any more details. Leitrim GAA Supporters Club 2018; Last chance to get your Leitrim supporters club tickets still a few left some great prizes first prize €5000, 2nd prize Trip to New York, 3rd €2000, 4th 1000 and 8 other prizes contact Michael O Dowd or Declan Shanley. Bord na Óg; The U17s travelled to Gortletteragh on Saturday last to play Rinn Gaels (Gortletteragh-Bornacoola). Finishing out on a scoreline of Annaduff 0-7 to Rinn Gaels 1-13 The lads now have a new management team of Daniel Duignan and Mathew Reynolds, best of luck to the team and new management. We are at home to Melvin Gaels on Saturday 3rd of March at 12 noon. U13s were due to play Glenfarne/Kilty on Sunday but unfortnulaty Glenfarne have pulled out of the League. Annaduff will be at home to Allen Gaels on Sunday 4th of March at 12 noon. Lotto; The Annaduff Parish & GAA lotto draw took place in the Brandywell Sunday 25th February. Numbers 2 17 19 23. No Winner Jackpot now stands at €3800 !! Next draw takes place in Taylors Sunday 11th March, Get your tickets in and as always thanks for your continued support. Division 3; The juniors get their year off with the first round of the league at home to Aughawillan on Saturday 3rd of March at 4-30pm. Best of luck to management and team. Intermediates; Our thanks to St Barrys for providing the opposition for a good challenge on Saturday last under lights in Termonbarry.